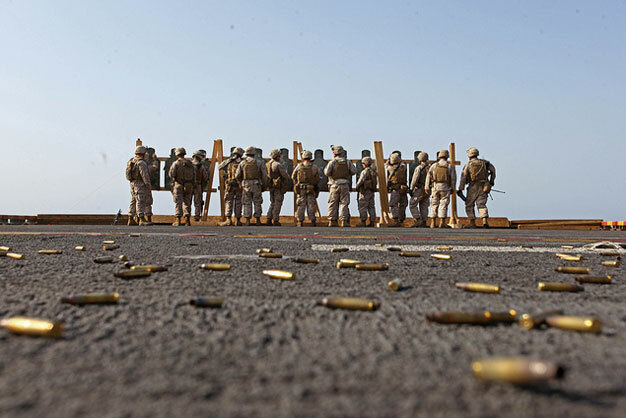 U.S. Marines with Battalion Landing Team, 1st Battalion, 2nd Marine Regiment, 24th Marine Expeditionary Unit (MEU), replace their targets after conducting a multiple target, live-fire range on the flight deck of the amphibious assault ship USS Iwo Jima (LHD 7, at an undisclosed location, Aug. 19, 2012.) DoD photo by Gunnery Sgt. Chad R. Kiehl, U.S. Marine Corps.